Compact and versatile: Our MOVITRAC® B frequency inverters have a sleek and modular design. And they are extremely versatile thanks to their wide power range. Time is money. The MOVITRAC® B series frequency inverters help you save both. Their basic operation means that these standard inverters are quickly ready for use and perform your tasks extremely efficiently: from fan applications to materials handling and basic positioning. Ideally suited for motors in our DR.. series, MOVITRAC® B frequency inverters control the speed of asynchronous and explosion protected EDR.. motors. You can use the standard MOVITRAC® B design in materials handling, pump applications or in centrifuges. Our modular concept with optional extensions and extensive accessories also gives you the flexibility to respond to specific requirements. with extremely compact dimensions, the book-style design and the seamless connection saves space in the control cabinet. with optional fieldbus interfaces and safety functions. because the MOVITRAC® B standard inverters have provided tried and tested reliability for a large range of applications for many years. thanks to straightforward startup and operation. with its STO (Safe Torque Off) safety function in accordance with PL d pursuant to EN ISO 13849-1 (except for size 0). BW series braking resistors are available for the regenerative operation of MOVITRAC® B frequency inverters. Using an integrated temperature sensor allows the resistor to be protected without external monitoring. The MOVITOOLS® MotionStudio program package allows you to conveniently start up, configure and run diagnostics for MOVITRAC® B frequency inverters and MOVIDRIVE® B drive inverters. MOVIDRIVE® MDR60A 15 kW to 160 kW MOVIDRIVE® MDR61B 160 kW to 315 kW regenerative power supply The regenerative power supply can supply multiple units with power using a central power supply connection. In regenerative mode, the power is fed back into the supply system. Using the MDR60A/MDR61B lets you save power and installation costs. Braking resistor type BW BW series braking resistors are available for regenerative operation of MOVITRAC® B frequency inverters and MOVIDRIVE® B drive inverters. Using an integrated temperature sensor, the resistor can be protected without external monitoring. 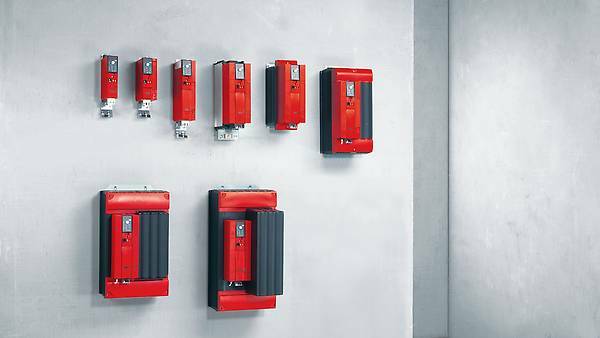 The compact and fully-equipped MOVITRAC® B standard frequency inverters are the cost-effective and energy-efficient choice for standard tasks.